The OnePlus 5's biggest update over the model it replaces is in the camera department. 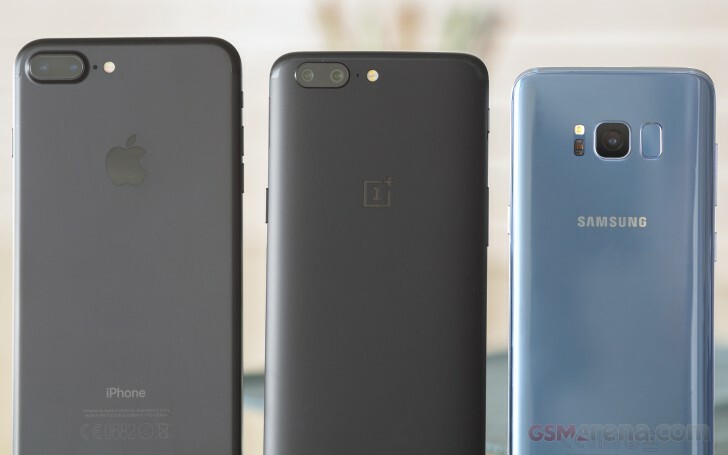 Dual cameras are everywhere now, and OnePlus is catching up - with a setup conceptually similar to the iPhone 7 Plus', only implemented differently. A 16MP primary cam is complemented by a 20MP secondary one, with the company advertizing a 2x lossless zoom. That, however, is achieved through multi-shot stacking, cropping and whatnot, and it's not strictly true. The iPhone 7 Plus is truer to the 2x zoom claim, with sensors and optics that do, in fact, provide a 28mm and 56mm equivalent focal lengths, respectively. Then again, Apple doesn't like the tele cam's output in low light, to the point that the phone uses the 28mm camera in the dark, cropping to match the required FOV. The Galaxy S8 stays away from all the dual-cam fuss - by all accounts, it's going to be the Note8 that will mark Samsung's entry into the field. It's not the exact same camera as the on the S7, though, at least not on the software side - Samsung's adopted a multi-exposure stacking algorithm. The Koreans haven't been overly specific on the matter, unlike Google which stated that the Pixel is constantly analyzing a 9-shot sequence taken immediately before you hit the shutter button. Anyways, the OP5 relies on a 16MP f/1.7 main camera with a Type 1/2.8" sensor and 1.12µm pixels, and a 20MP f/2.6 secondary camera with, again, a Type 1/2.8" sensor and 1.0µm pixels. EXIF data reports 24mm and 36mm equivalent focal lengths. Neither module has OIS. The iPhone 7 Plus packs two 12MP sensors - the primary one is a Type 1/3" affair paired with a stabilized 28mm-equiv. lens with an f/1.8 aperture, while the secondary one is a smaller Type 1/3.6" imager behind dimmer f/2.8 glass. Samsung's only sensor is a Type 1/2.5" unit with 12 million-something 1.4µm dual pixels (as in, each of them serves as a phase detection agent). A stabilized 26mm-equiv. lens with an f/1.7 aperture sits in front of it. The iPhone 7 Plus has Apple's usual camera interface. Swiping up and down (when held in landscape) switches between modes (stills, video, panorama, portrait, the lot). Tapping on the viewfinder gives you control over exposure via a slider, the HDR toggle is handy, filters are available, and tapping on the 1x button takes you straight to 2x zoom. If only you had control over video resolution from the camera app, instead of having to delve into the settings menu. The OnePlus 5's camera app uses the up/down swipe just for switching between stills, video and portrait. Other shooting modes are accessible from the hamburger menu, which is where you'll find the panorama mode and pro mode. Pro mode is particularly interesting, as it offers a live histogram. The Galaxy S8 has its own way of using swipe gestures. Swiping to the right gives you a selection of shooting modes, while swiping to the right brings up the filters. A movie mode with a separate viewfinder would have been much appreciated, but no. We're also not raving about the immediate availability of snapchat-style overlays. Either way, the vertical swipe to switch cameras is very convenient.